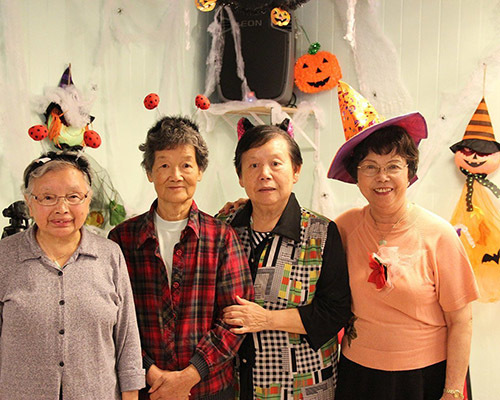 Established in 1980 by Dr. Frances Wu, Golden Age Village is owned and governed by the Chinese American Golden Age Association, a 501(c)(3) non-profit organization. The property was developed with funding through the HUD Section 8 202 program which provides funding for housing for seniors who are 62 or older. 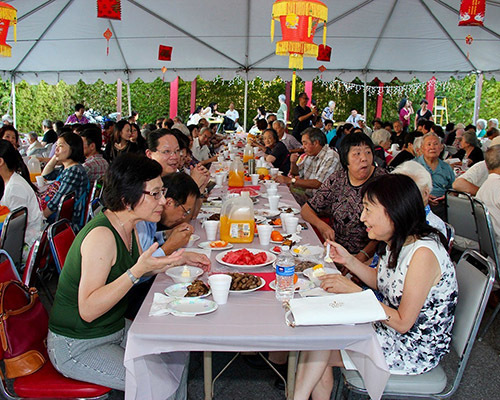 There are a total of 120 rental units, and about 150 seniors, with 99% of which are Asian Chinese people. To enhance the residents’ quality of life, the property provides management service and social service. The GAV also has a gym, a library, a computer room and a multi-purpose room. My Master’s Degree was in Child Welfare. While I was working in the New York area for more than 15 years, I saw a great need to provide services for the elderly Chinese, especially the new immigrants from Mainland China in the late 1960s. Because of language problems, cultural differences and generation gaps with their Americanized sons and daughters, they had difficulty adjusting in a foreign country. Being a social worker and Chinese, I thought I should do something about this problem. In order to prepare myself for the task, I decided to pursue the advanced degree of Doctorate in Aging. I left New York in March 1971 and drove to Los Angeles by myself with the intention of going back to school to study Aging. There was no school of Gerontology in the United States at that time. So I chose Social Work with a specialization in Aging. That was how the Golden Age Village came into being. The story of Golden Age Village started as a ”dream come true”. It also started with a series of ”miracles”, and each miracle involved a ”God Sent” person who helped me. 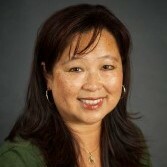 Soon after I arrived in Los Angeles, I applied to the USC School of Social Work for a Doctorate. There I met Professor Feldman, Chairman of Doctoral Admissions. She told me the school only offered ”Teaching” or ”Research” in the Doctoral Program. I said I was not interested in either one but was very much interested in studying ”Aging and Administration”. I then described in detail the adjustment difficulties of newly immigrated elderly Chinese from inland China as indicated above and my intentions were to develop programs and services for them. Professor Feldman took an immediate interest in my dream. She accepted my application and also made arrangements for me to take courses in Gerontology and Administration. In addition, when a student in the Doctoral Program withdrew, she immediately transferred that student’s scholarship and stipend to me. I was delighted, for that made it possible for me to complete my Doctoral study and dissertation (1974) according to my pe1·son a1 interest and professional need without worrying about the financial burden. This constituted the first miracle in the pursuance of my dreams. After graduating from USC, I organized a senior citizen’s association with the purpose of applying for a loan from HUD. Together with the 50 Chinese elderly that I interviewed for my research dissertation and their friends, more than 100 of us held our first meeting at the community room of Cathay Bank in Chinatown, Los Angeles. They elected me President of the Association. Feeling that I lacked the necessary experience in community organization, I offered the presidency to someone who was a reputable senior in the community. Much to my disappointment, one and a half years went by and the organization was not properly set up because he kept on delaying the filing for an article of incorporation that I had prepared. Someone suggested for me to visit the Legal Aid Foundation. I went to see Mr. Multinsky, a very experienced corporate attorney who had retired early and moved to Los Angeles from N.Y. due to a medical condition. Reluctant to stay away from the practice of law, he became a part-time volunteer at the Legal Aid Foundation. Following his advice, I withdrew from the original organization and founded the Chinese-American Golden Age Association (1975) instead. Mr. Multinsky helped me rewrite the Article of Incorporation and by-laws geared to our Association’s special nature and needs. We went to the Secretary of State’s office in downtown L.A. and obtained ot1r nonprofit organization status right away. I should mention that the Association started with zero funding. The $200 application fee was borrowed from one of our members and we did not pay any attorney’s fees. With Mr. Multinsky’s help during the initial set up, our Association sailed along smoothly, and as of this date, there have never been any problems within the Association. L certainly consider Mr. Multinsky a ‘Godsend’. In order to find a place to build our senior citizens’ housing complex, I drove around Monterey Park and the San Gabriel Valley area and asked a few real estate agents to help me, but did not have any luck. By chance, somebody suggested that I contact the city manager of Monterey Park, Mr. DeLames. After hearing the purpose of my visit, he showed me three large parcels of land on a map on his office wall. These lands were acquired by the Garvey School District through Eminent Domain to build an elementary school and playground for children. But the plan was abandoned due to a decrease in the school­ age population at that time. One parcel of land was designated for a City park and would not be sold. The other two parcels were ready for sale, and a nonprofit organization would have priority to bid on them. Mr. DeLames told me to see the superintendent of the Garvey School District right away, together with a real estate broker. Words could not describe my happiness. It was as if l had hit a gold mine. After I left Mr. DeLames’ office, I immediately started looking for a real estate broker. 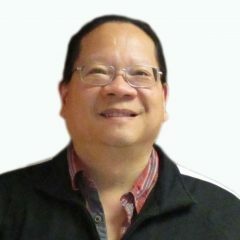 One of our members told me about Fred Hsieh, and that his parents were members. I wasted no time in paying a visit to Fred’s family and brought him to the Garvey School District. We met with Dr. De Arakal, the superintendent, and I explained my purpose for needing the land. He showed great interest in my plan to build senior citizen’s housing. When he learned that I was a graduate of USC, he told me that he too was a USC alumnus. Since we were in the process of applying for a HUD loan at that time, Dr. De Arakal agreed to reserve the land for us and produced a document to that effect for the Association to include in our application package. Unfortunately, our first application submitted in 1977 was rejected and we were advised by HUD to apply again the following year. We discussed the matter with the school district and were told that, due to state policy, they could not hold the land for us, but could only extend the time for six months to allow us to purchase it. That was where our current three senior projects (GAV Village, Manor, & Villa) are located today. Also available for sale was another more than one-acre parcel across the street next to the city park. The total price (for more than six acres) was offered for $584,200. Before I could say anything, Fred made a gesture to me indicating that we should purchase both of them. It appeared that the Japanese had built a 300-unit HUD project in Little Tokyo named Tokyo Towers for their seniors in Los Angeles, and the land was purchased by four Japanese companies. Therefore, we thought we could do the same by writing letters, making newspaper announcements and phone calls to solicit donations, but we did not receive any response. Three months had passed, and we only had another three months left to raise more than half a million dollars. Finally, it was Fred’s ingenious plan to convince an investor to purchase the smaller piece of land on the west side of Rural Drive adjacent to the park, with the condition to lend enough money to CAGAA to purchase the bigger piece at 10% interest, When HUD approved our second application for the loan for construction of the Golden Age Village in 1978 and reimbursed us the cost of the land. We used it to pay back the money we had borrowed. What a miracle it was for the Association to own more than six acres of such valuable land in Monterey Park without paying a penny, so to speak. On this land, we have built three retirement projects: Golden Age Village (1980), Golden Age Manor (1986), Golden Age Villa (1994). 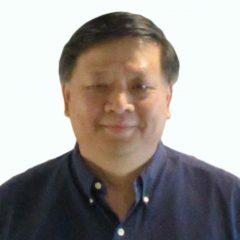 Who could say that Fred Hsieh was not a person “God Sent” to help us? For this we are forever indebted to him. It is with deepest regret that Mr. Hsieh passed in 1999. In memory of his contribution, we have planted a Sweet Olive tree in the front garden of GAV. Our Housing Consultant, Mr. Bob Cummings, was in charge of our loan application. He went to the HUD office in Washington D.C. regarding our second application. He was told that the Association should ask the USC Gerontology Center to cosponsor the loan and recommended that we invite a few young and non-Chinese board members. Therefore, I made a trip to USC, talked to my teacher Prof. Birren, told him about the two recommendations from HUD, and received a very positive response. He said he would present my request to the USC Board of Trustees and would select several young American professors of Gerontology to join the CAGAA Board. I was very proud that, as a member of the USC Trojan Family, I received such support from the school. In the Association’s second application for a HUD loan, we had Dr. James Birren as our cosponsor, with Mr. Jay J. Glassman, Mr. Victor A Regnier and Dr. Paul A. Kerschner included in our Board of Directors. Of a total of 140 applications submitted to HUD from California in 1978, only 14 were accepted and ours was one of them. Other applicants were big, well-known organizations such as the Jewish Welfare Fede1·ation of San Francisco, First Congregational Chu1·ch of Berkeley, Salvation Army of California, L.A., Rom an Catholic Diocese of San Diego, YWCA of San Francisco, and the Catholic Welfare League A1·chdioceses of L.A. etc. The fact that CAGAA, being a newly organized, small senior citizen’s organization without any assets or track record in housing and without a co1runu11ity base, was able to successfully obtain loan approval from HUD was certainly a ”miracle”, and Professor James Birren was my help from Heaven. As suggested by our housing consultant Mr. Cummings, I took a trip to Washington D.C. My first interview with a HUD loan officer was very unpleasant. He gave me the impression that there were thousands of applicants for HUD loans from all over the country every year. If every one of them had come to D.C. to see him, they would not have time for their day-to-day operation. I was disappointed with his attitude, but not discouraged. So I started calling our senators and congressman. Both Senator Alan Cranston and Congressman George Danielson were out town. Luckily, Senator Hayakawa was in his office. I introduced my and explained my unhappy experience with the HUD officer. Senator Hayakawa was very helpful, and in trt1cted his staff to make an appointment for me to see an officer of a higher position at HUD. My interview with that officer was very pleasant. I told him about the difficulties new Chinese immigrants from China were facing, how they could not adjust to other senior citizen apartments because of language and cultural differences, and that living together with people of their own heritage could be the solution. The loan officer listened intensely. Finally, he made a phone call. When he finished, with a smile on his face he told me, “Go home and wait for the good news.” When I beard that I felt it was a sweet answer to all our members’ prayers. Indeed, the involvement of Senator Hayakawa was a “miracle”. The loan approval by HUD for the construction of the project was $5.5 million. But it was a standard practice of HUD at the Los Angeles office to tighten the budget and reduce the loan amount to the minimum. We were told that it was reduced to $4.5 million. They also ruled to eliminate the fishpond and pavilion, according to Flewelling and Moody, the architectural firm that had designed Golden Age Village, because HUD considered these luxury item s and were not suitable for low-income housing. The architectural firm suggested that I appeal the decision. I went to the HUD office twice, talked to two different loan officers, but to no avail. Then somebody at the HUD office told me to see Chief Architect Harry Wong, who was Chinese. Mr. Wong was an American Born Chinese (ABC) who could not speak Chinese and had never been to China. In order to impress upon him the necessity to keep the fishpond and pavilion, I told him the story of new elderly Chinese immigrants from mainland China. In addition to language problems the majority of them had limited educational backgrounds. Unlike American elderly who could swim play tennis, drive around to visit friends or take part in social dances, etc., the recreational abilities for our Chinese elderly were extremely limited. Not only can the fishpond and pavilion be considered facilities for recreation, they would also provide our tenants with some Chinese cultural appreciation and a home-like atmosphere making them feel more at home in this foreign country. Harry listened with great interest and told me he supported my idea. He said that he would make an appointment for me to see the Chief Loan Officer and that he would personally present his approval as well. The accomplishment of our mission to save the fishpond and pavilion was truly another ”miracle”. One HUD requirement was that properties financed by HUD must be managed by pre-approved companies. While taking a training class offered by the National Center for Housing Management (NCHM) Inc., I asked the president, Mr. Samuel Simmons, if his company would be interested in managing our project. His answer was that since his office did not manage housing and being headquartered in Washington D.C., they were not familiar with any management companies in the L.A. area and could not recommend a company for us. However, he did know a well-qualified person who was looking for a job. He then made an arrangement for me to meet Pat Clark. My initial impression of Pat was very good and I immediately asked her to be our managing agent. Since she was not working at that time and was not affiliated with a management company to fill the HUD requirement, Mr. Simmons graciously agreed to hire her on his staff with the sole purpose of managing Golden Age Village. One year had passed and Pat’s management went very well. We received a ”Superior” rating from HUD in the first inspection in 1981. The Managing Agent, Pat Clark, the field representative, as well as the project staff are to be commended for their exceptional performance in accounting procedures, maintenance of tenant files, maintenance of the buildings, and the excellent rapport established with the tenants. GAV received ”Beautification Award” from M.P. Ci ty Hall in 1996. I attribute all these achievements to Pat Clark’s leader hip in training and supervising the staff. I consider myself very fortunate and feel strongly that Pat is one of the ”Godsend” to help me. In 1978, the land we had purchased about five acres, but only 3.67 were used for construction of the Village. With the remainder, the CAGAA originally planned to build a residential care home that would provide room and board for the frail elderly. 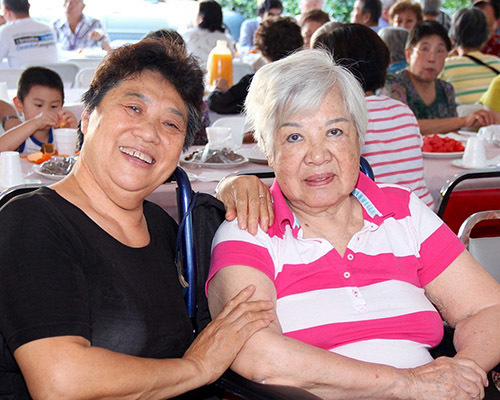 Since GAV was HUD financed, it was limited to low-income seniors only. Many of our Association members who could not qualify requested that we build another project suitable for them. After consulting with an architect, we decided to subdivide the land into two parcels with the intent to build a condominium project on one and to reserve the others for a board and care home. In 1986, a 33-uint condominium, Golden Age Manor was completed. After that, we started to raise money for the construction of the 100-unit board and care home, but the result was not as satisfactory as expected. We changed our plan to build another condominium project instead. That was how the 29-unit Golden Age Villa was built in 1994. Due to skyrocketing real estate values in the Southland during the 80s, values allocated toward the land for these two condominium projects plus the net proceed from the sale of all units, much to our surprise, had made the Association a healthy profit of $1.5 million. 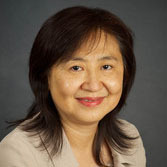 After careful consideration and consultation with an attorney, the Board decided to donate the money to the USC School of Social Work and, in accordance with the Association’s Article of Incorporation, stipulated the money for training of Chinese social worker in developing programs and services for Chinese elderly. Since there are elderly Chinese all over the world, the need for trained social workers are worldwide. I feel that if the USC School of Social Work could train one Frances Wu to successfully benefit more than 200 seniors, this Endowed Chair should make it possible to train many more social workers for generations to come. If this is not miracle, then what is? Without help from the above-mentioned ”God Sent” persons, I could not have attained today’s success. Indeed, word cannot express my appreciation to each and every one of them. In addition, there have been other important people who have helped me tremendously, particularly the CAGAA Board of Directors. I always get 100% support from every one of them regardless of problems or whether I was in low or high spirit. We truly function like a small family with a lot of open discussions and understanding. That is why our meetings always proceed smoothly and productively. I also want to thank many of our Association member and my personal friends. They were always very supportive whenever we had fund-raising events or special activities. I often feel ”blessed” to be surrounded by lovely people and to be living in such a beautiful environment. GOD BLESS GOLDEN AGE HOMES! Copyright © 2019 Chinese American Golden Age Association. Powered by WordPress. Theme: Esteem by ThemeGrill.